Lozzo di Cadore: the Historic Irrigation Ditch, Botanic Trail and Upland Walks Offer a Good Blend of Nature and Culture. Lozzo di Cadore, with its Rio Rin irrigation ditch (“Roggia dei Mulini”; see an image above), offers certainly one of the most interesting examples of industrial archaeology in the area. Here are many examples of pre-industrial activities linked to the use of water power, as along the Rio Rin there are various constructions which were at once used as mills, woolen mills, forges, sawmills, and one of the first power stations (which is still in use). 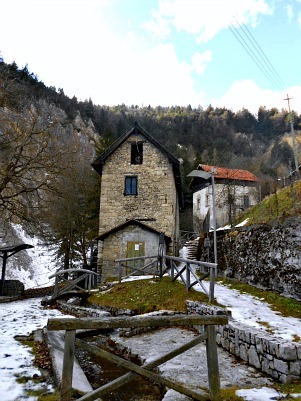 One of the objectives (part of a program to enhance the European cultural heritage through the Co-operative conservation and development of an exchange of experiences and technical expertise) was to restore four Pre-industrial watermills and their environments in four European countries: Italy, Slovenia, France and UK. Until the beginning of this century, there were several mills in Cadore which contained machinery powered by water, and the Rio Rin irrigation ditch in Lozzo di Cadore is one of the few remaining examples that still bear testimony to the widespread use of water power in Cadore. Numerous activities developed through the centuries along this small stream (Rio Rin), using water energy taken from an irrigation ditch which started in an area called ‘Crepe Ros’. From the records of 1766 we learn that in Lozzo there were ten water-wheels for grinding mills, one saw mill, one woolen mill, sixteen weaving sheds and five milestones. Some of these buildings – including the communal and Pellegrini sawmills in the lower part of the village – were destroyed by the fire of 1867. Ottone Brentari’s guide of 1886 states that there were five mills and one sawmill along the Rio Rin; a few years later, in 1903, there were five mills, a forge, a sawmill, a blacksmith’s smithy and two woolen mills. After WW1, other mills were built and used as sawmills and carpenter’s workshops; later, a woolen mill was also opened. In the second half of the 20th century – and in particular after the flood of 1966 – most of these mills were closed, and at the present time only the small power station is still in working conditions. Besides the mills along the irrigation ditch, several other small industries developed in Lozzo, but today the only remaining evidence are some of the buildings which have been restored. In addition to the old diary in the centre (see below) and the more modern one there was a stove factory, a carpenter’s workshop and another workshop specialized in the construction of carts. Other buildings of historical interest are the old houses in the vernacular style of Cadore – especially Casa Zanetti, saved from the 1867 fire; see image below – the deconsecrated church of San Lorenzo (now culture centre and concert hall), planned by the architect Segusini, the Loreto Sanctuary, and the numerous fountains and wash-troughs along the streets and at the crossroads, in addition to the summer Alpine pastures at the Pian dei Buoi plateau (see also below) and the places of recollection of WW1 (the old defensive works). The Da Pra and Callegaro mill is one of the most notable of these buildings and it was already present in the 1830 register. In 1903 it appears to be dedicated to two activities, partly as a cloth mill and partly as a forge; in 1923 it was then registered as working as a mill. From a drawing of 1923 it also appears that the water of the Rio Rin, after operating the upper part of the building, travelled along a wooden irrigation ditch and after a jump of about 5 metres fell onto two wooden wheels outside the building, which operated the lower half of the mill. The ground floor of both mills housed two millstones, whilst the upper floor was used by the millers; the lower part of the building was also enlarged to house a forge. The two mills inside this building were among the first ones belonging to the irrigation ditch to stop their production activities; at present, in the ground floor of the upper section of the building a generator has been installed, which backs up the electricity produced by the power station. Women once used wool to hand make dresses, jackets, socks and jumpers: wool tissues were coloured using natural dyes taken from trees and nuts; from 1885 to 1910 there was a ‘follo’ here, where wool were cooked and treated to obtain “cooked wool”, then dyed. Lozzo di Cadore is also important for its ‘Rifabbrico’: a disposition of the Austrian government in Venice, dated 1845, imposed – in the event of fire – the use of stone for all new buildings and the parts of old buildings to be reconstructed. 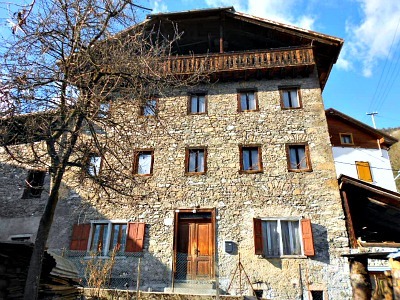 The term ‘Rifabbrico’ – that in origin indicated the quantity of timber that each ‘regoliere’ would receive as a right from the ‘Regola’ for the construction of his house – is therefore used in this instance to indicate not only the material destined from the community to reconstruction (it would not have been possible, in fact, to conceive such a demanding job without first having the support of the community), but also the actual reconstruction plan (“Piano di ‘Rifabbrico’”); some parts of the township of Lozzo – most notably the houses in Giòuda, Bròilo and Mèdavila – still carry today evident traces of this project. The term ‘Rifabbrico’, in this case, indicates therefore – for the first time – both the reconstruction plan, as originally defined by Arch. Simeone Zanetti and subsequently reviewed by Arch. Palatini, and the norms imposed on the inhabitants of Lozzo, at the time (1867) no longer belonging to a ‘Regola’ (below, see an image of a typically reconstructed 'Rifabbrico' house, with the main body in stone but an open wooden structure under the roof to dry hay). The “Latteria sociale” ('Social Dairy') in Lozzo di Cadore was born in 1884 with the goal of bettering and enhancing the activities linked to milk transformation. In 1891, a building dedicated exclusively to dairy activities (‘Latarìa vecia’; ‘Old Dairy’) was erected in the village’s main square. From the second half of the 1900s, the gradual disappearance of farming activities led to a restructuring of the dairy’s role; in 1962, the dairy was transferred to the current building (now seat of the museum) and in fact it closed down for good in 1984. Ten years later (in 1994), the transformation into a cultural association was decreed, “with the goal of developing and spreading knowledge of the local traditions by means of cultural, recreational and educational activites” – among other things. Especially thanks to the support of volunteers, the first nucleus of the Dairy Museum (“Museo della Latteria”) opened to the public in 1997; since then, the museum has enriched its collections with new material as well as photographic and archive documents. In 2005, a contract with the local municipality based on a convention for the “support and development” of the institution tied both parts to a commitment to renew the museum's collections and expand the areas of thematic interest to the whole territory of Cadore, as well as to contemporary times. Inaugurated with its current exhibit in 2010, the museum is now articulated into 4 sections dedicated to the history and functioning of dairies and the practice of ‘alpeggio’ in high altitudes – that is, the yearly rhythm of taking the animals up and down the mountain slopes along with the changing seasons, again both in reference to Cadore as a whole and the territory of Lozzo in particular. Ample space is also kept aside for visual documentation, with films on dairy techniques and the collective memories of the local community, complete with video-interviews of those who have embarked on the profession of farmers and cheese makers ('casari'). Additionally, peculiar relevance is given to traditional terminology in the Ladin patois of Cadore, as spoken in the local variant of Lozzo di Cadore – a particularly important historic and cultural heritage for this community. 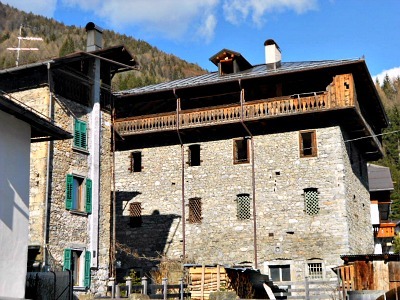 The museum now aims to be a meeting hub but also a place of reflection on the past and on the present, as well as a tool for the recovery and valuing of knowledge and skills that can still play a part in the reconstruction of the collective identity of Cadore (Lozzo in particular) and of mountain culture at large. The majority of families in Cadore had at their disposal some small – mostly narrow – strips of meadow distributed at different altitude bands. The distance of some of these properties from the barns and the hay lofts (generally located in the villages) rendered necessary the creation of small rustic wooden buildings known as ‘tabià’ – distributed in several locations – for the conservation of hay. In spring, before the grass grew, the meadows were being cleared of stones and branches that may have made working with scythes difficult. Between May and June, the grass was being scythed from the meadows at low levels and at mid altitudes; after this first cut, the grass had to be dispersed and turned around, so that it could dry properly in the sun. At the end of each working day, before the evening, the grass would be gathered in stacks, and the following morning it would be scattered again in order to bring the drying process to completion. Around July, scything of grass at high altitudes began, and the distance of the meadows from the houses obliged the farmers to move and live in the ‘tabià’, even for long periods. The hay that could not be taken to the villages immediately with carts was then gathered in huge stacks or in the hay lofts; during the winter, hay would then be transported to the valley floors by carrying it on one’s shoulders or, if there was snow, on the sleighs. In the village, the barn and the hay lofts were often annexed to the house, and each family had an average of 1 or 2 cattle. In the barn would also find shelter a variable number of sheep and goat; from the autumn to late spring the animals were kept inside, and taken outdoors only to drink at the fountain, while at the onset of the summer season – albeit with different modalities from family to family and from village to village – the livestock were taken to graze in some valley floor meadows, to get them accustomed again to the open air before the proper ‘alpeggio’ season began in the summer. Care of the animals – especially when they were few – was entrusted to women; daily work in the barn was dictated by the rhythm of a sequence of operations: the giving of food (hay and a mixture of water and flour) and drink; cleaning the barn; milking; renewing the litter; also, from time to time, the animals’ furs needed to be looked after. From the 1900s, in each village there was also a dedicated place where the bull was kept, and every year – between January and April – cattle would be taken to the bull for reproduction, so that the new born calf would come in winter, when the other activities connected with the land would slow down. In the months following the calf's birth work was demanding: the newborn animal needed constant care and attention, as it needed to develop the ability to eat autonomously – but if it were male, it would be slaughtered quite soon (about twenty days), while if it was female, it would be raised in order to renew the livestock. An important role was also given to the raising of sheep and goat, as goat’s milk was part of the daily diet, while the production of dairy happened almost exclusively in the ‘malga’ (dairy). In the Co-operative dairies, also, goats were raised for the sale of kids and lambs. This trail ('Sentiero Botanico Tita Poa') takes its name from a local man who used to walk it every day of his long life, until he died at 105; the idea is to remember his great energy, his vitality and lust for life. The trail covers an itinerary of about 1,550 metres that follows the wooded slopes to the north of the village between 800 and 930 metres of altitude; it was created in 1991 by the local section of the CAI (Alpine Club) with the contribution of several businesses and individuals – not the least the family of Tita Poa himself. The track corresponds to a section of the many trails that collectively form the “Parco Sentieristico Terre Alte” (a network of paths marked blue-yellow-blue). The Sentiero Botanico is also part of the medium-distance trail "Traversata del Centro Cadore" that crosses the whole region of Cadore, further divided into ten shorter sections, each of which is dedicated to a specific theme. Through this thematic trail, the idea is to inspire the walker to appreciate, admire, get to know and ultimately protect the natural environment that surrounds us, with a particular focus on vegetation. Maintenance of the trail does not include active interventions or the planting of non-autochthonous species; therefore, the vegetation present here is all strictly spontaneous, while the work of man is limited to keep the path open to transit, with minimal intervention. The species that have been individuated have all been marked with small plastic labels usually located no more than 30 cm away from the plant (but the area is not checked often, and while being used also for school workshops, it is always best to keep an eye for labels that may have been moved away from the actual plant they are meant to represent). On the label are also reported the botanic characteristics of the plant: habitat, area of distribution, flowering time and some other characteristics that may assist in the identification; it is important to stress, however, that this is not a scientific or botanic facility as such, but rather a themed trail geared at self-aided discovery (as well as being used, as stated before, by local schools). The labels offer some indication as to the traditional use of the plant, with a text both in Italian and in the local Ladin variant (‘Ladino Cadorino’); some also report the features of the place and the local name of the area. Along the trail there are some sites dedicated to bird-watching too, with indications on the species of birds that can be spotted in this territory, as well as instructions on how to best approach them for a sighting without disturbing. Ultimately, the “Tita Poa Botanic Trail” is like a ‘natural classroom’ that can help one identify the main plant species that are present in the mountains of Cadore. The trail is particularly good in order to discover – with a bit of attention – the four different types of conifers which are also the most common in Cadore: Norway Spruce, Silver Fir, Scotch’ Pine and Larch (the common English names, sometimes, do not make justice to the fact that all four are actually autochthonous species to the area). Norway Spruce (Picea abies) is certainly by far the most important tree in these mountains; its actual diffusion was helped by man, who has always recognized its commercial value – both directly with plantations (as it can indeed be appreciated here) and indirectly, with interventions that have privileged its presence. Silver fir (Abies alba) is a conifer easily distinguished from Norway Spruce, and recognizable by some characteristics: the bark is greyer rather than reddish; leaves are larger, less prickly, and on the inferior page they have two whitish lines (it is a clearly ‘discolor’ leaf); also, the fruits (the so-called ‘cones’) are pointing upwards rather than downwards, as in Norway Spruce. However, some characteristics make this species more exigent and vulnerable than its counterpart: the Silver fir prefers a more fertile situation and badly tolerates soils that either lose their water too quickly or are prone to excessive water stagnation. The young plants love the shadow (another characteristic which is opposite to Norway Spruce) and can develop quite slowly for a number of years, before emerging and then growing quite rapidly, reaching diameters and statures of quite surprising dimensions. An interesting example of a Silver fir woodland can be appreciated in the Val Longiarin, and as a note of curiosity, the ungulates show a particular appreciation for the tender leaf buds of this tree. Scotch Pine (Pinus sylvestris) is easily recognized by the dark grey bark in the lower part of the trunk and the characteristic orange color in the upper section. Its needles are in pair and about 6 cm long, of a pale green and slightly curved; on the whole, they give the canopy a bluish tinge. Scotch Pine are pioneer trees, highly resistant to aridity, and therefore they tend to colonize rocky habitats, or soils derived from ancient landslides and detritus’ conoids – once these are consolidated. They do need a lot of light, however; therefore, they form sparse stands on sunny slopes. In Centro Cadore, Scotch Pine is widespread in the most difficult habitats, and it can be observed also in several locations around Lozzo, but most frequently in the territory of Pieve di Cadore, especially on the slopes on the left bank of the Piave, in a series of uninhabited and relatively wild valleys from the Val Talagona (Domegge) all the way to the Val Montina (Perarolo), where Scotch Pine is sometimes associated with Black Pine (Pinus nigra), and it forms some amongst the most interesting conifer associations within the whole province of Belluno. Larch (Larix decidua) is a species of exceptional forestry, naturalistic and landscape value, and it is well distributed within the whole area, where – at the most elevated altitudes – it also forms pure stands (larch woods; 'lariceti' in Italian). Together with Arolla Pine (Pinus cembra), it is the tree that reaches the maximum heights in terms of altitude in the Dolomites, as it is a tenacious plant, resilient and with a long life span, able also to thrive in extreme environmental conditions. Often the weight of the snow curves the base of the trunk; wind, lightning, frosts and other meteoric events also all condition its habit of growth and determine sometimes strange and curious shapes, both in the canopy and in the trunks (in order to observe these aspects, it is enough to hike to Pian dei Buoi; see below). In the valley floors, often the larch has been used in small plantations that replaced old, abandoned agricultural land – as it can indeed be appreciated right in the surroundings of Lozzo, where there are many such situations. However, if you wish to come into contact with purer and wider forest habitats, you need to abandon the valley floor and head for higher altitudes; in this respect, the upland plateau of Pian dei Buoi is certainly one of the most fascinating environments in the area, easily reachable; among its most interesting locations are Col Vidàl (around 1,800 m of altitude), Rifugio Ciareido (1,969 m), Rifugio Baion (1,825 m) and the area of Campiviei. The “Tita Poa Botanic Trail” is also developed in parallel to the so-called “Strada del Genio”, traced originally for military purposes in an area of contact between woodland and more open spaces such as meadows. Once, this area was more intensively exploited for agricultural use, while today we can witness a progressive return of vegetation – more or less spontaneous, and sometimes actually favoured by men through interventions like the new small tree plantations. As well as the conifer species mentioned above, there are also some broadleaved trees in the area, such as beech, maple, rowan and several shrubs. These areas of margin between woodland and more open spaces are sometimes called ‘ecotones’, and are usually the best ones where to spot wild animals, as they often find shelter here; among those that can be more easily spotted in the area, one certainly has to include deer and roe-deer. Wetlands, also – even those of small extension – are very favourable environments in which to spot wildlife or traces of their passing; very often, in fact, deer and roe-deer leave in the mud traces of their activity – especially at night-time. Also, in the morning and in the evening – most notably during the summer – birds that frequent small ponds and streams to drink or bathe can occasionally be observed, and feathers can be found. Most importantly, however, these habitats are notable for the amphibian presences: these are tiny creatures that spend the greatest amount of their lifetime in the woodland, but do reach ponds and streams in spring in order to reproduce; the salamander, for instance, prefers pools of still water at the margin of small streams, while the common mountain frog lays its eggs in all sorts of water basins, however small (pools, streams, fountains, marshlands and the ‘lame’ – disused ponds that were first dug artificially for animals grazing in the area).